Fans packed into the historic venue and millions more watched worldwide as the first ever WWE UK Championship tournament came to the resort last night. The two-day, 16-man, knockout-style tournament saw wrestlers travel from every corner of the UK and the Republic of Ireland, with all five nations represented. One of the biggest cheers of the night came when 14-time WWE champion Triple H was accompanied to the ring by William Regal, who first made a name for himself aged 15, wrestling at the Horseshoe Showbar at Blackpool Pleasure Beach. 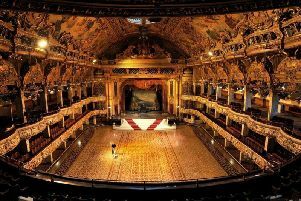 Explaining why they chose the Empress Ballroom to put on just a historic competition, Triple H said: “Blackpool has this reputation. It’s easy to get to, a lot of people come here and when they come here they lose it and that’s what we wanted. Everybody involved certainly did just that and fans came from all over to make it such a special night. Gino Hynes and John Nottage, both 26, came all the way from Great Yarmouth, in Norfolk to see the first ever WWE UK Champion crowned. “This is just absolutely massive.” John said. It’s true. This tournament seems to be the pinnacle of a golden age for the British wrestling scene. Over Christmas, ITV brought back the hugely popular ‘World of Sport’ for a one-off special, featuring even more of the finest independent talent in the UK. The fans really made last night’s event what it was, with constant chanting throughout, creating much amusement, although a lot of what was said can’t be repeated in the newspaper! A lot of the chanting was fantastically British though and the wrestlers got in on the act with cockney Danny Burch shouting “oi oi” after knocking his opponent Jordan Devlin to the canvas. There was also a number of fans donning t-shirts of some of their favourite wrestlers and even a whole row of ‘hulkamaniacs’ donning the iconic garb of Hulk Hogan. It’s fair to say that wrestling fans are some of the most passionate. They love the storytelling in the matches, ‘goodies vs baddies’, it’s a sort-of pantomime, a soap opera and an action film rolled into one. When local lad Sam Gradwell, from Central Drive, got ‘attacked’ by Peter Dunne ahead of their quarter final clash, it was a real heart-in-mouth moment as you become so invested in the characters in such a short time, that you suspend your disbelief. It also cemented Dunne’s role as the pantomime villain or ‘heel’ as it’s known in wrestling and Gradwell as the courageous underdog. Fellow local competitor James Drake, from St Annes, didn’t manage to progress to the knockout stages but he did put on one of the best ties of the first round against Nottingham’s Joseph Conners. It’s fair to say that a number of stars were born. 19-year-old Tyler Bate, in particular, captured everyone’s attention with his charisma and in-ring ability at such a young age.